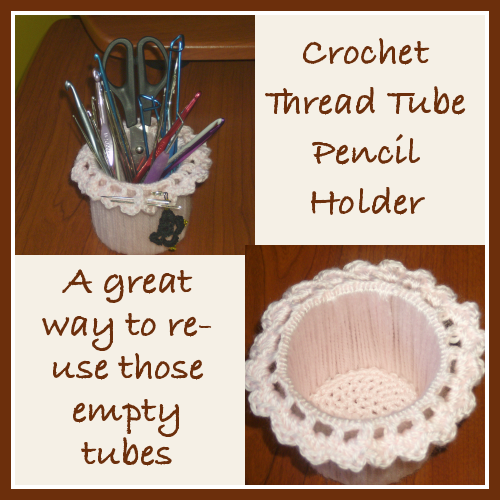 Here’s a cool project to help you use up those empty cardboard rolls from cotton crochet thread. The rolls come in two different sizes; the size 10 comes in a larger roll, and the size 3 is in a small roll. For this project I used the size 3 roll, which gives me a good height for pens as well as for my crochet hooks. In order to prevent the crochet hooks from sliding through, I placed a round piece of cardboard at the bottom. 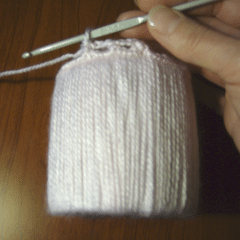 I used a light weight yarn, however, I am sure that any type of yarn would work just as well. 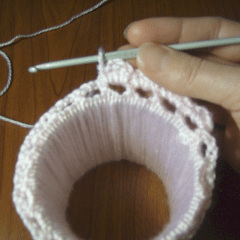 It’s a little tedious working the yarn around the tube, but it’s worth it. 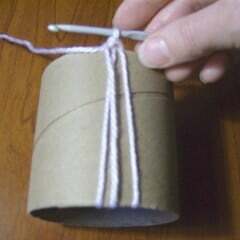 Material: 1 3×3 inch cardboard tube, light weight yarn. 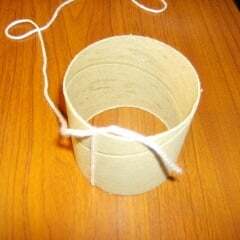 Insert the yarn through the cardboard tube, tie a knot and position the knot at the top of the tube. 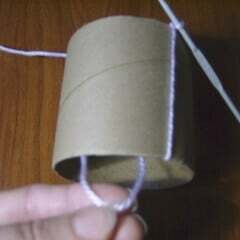 Insert hook between the tube and strand of yarn, yo and pull up a loop. 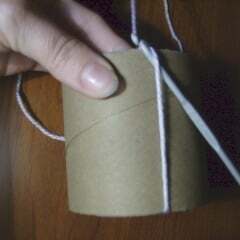 With your hand or another hook bring the long end of the yarn through to the bottom of the tube. 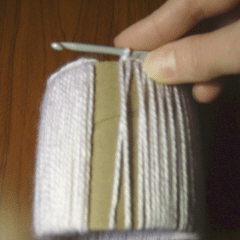 Continue with steps 3 and 4 all around the tube, pushing the finished stitches together so that the cardboard tube does not show. Join with sl st.
Rnd 2: Turn, sl st into loop, ch 1, (sc, hdc, dc, hdc, sc) all in the same loop and in each loop all aound. Join with sl st.. Fasten off. Ch 3, join with sl st to first ch to form circle. Rnd 1: 2 sc in each st all around. Rnd 2-3: Repeat rnd 1. Rnd 6: Repeat rnd 5, ending with sc in next 2 sts. 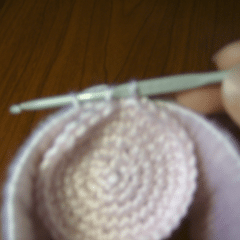 (42 sts) Depending on what type of yarn you use, you may need to do another increase round. Rnd 7: Working into back loops and into the loops around the tube, join the two pieces together with sl sts. Fasten off.